May. The month of whisky festivals. World Whisky Day, the Whisky Stramash, and the Campbeltown Malts Festival are book-ended by the Spirit of Speyside Whisky Festival at the start of May and Feis Ile at the end, to create a jam packed month of whisky heaven. To celebrate the Spirit of Speyside Whisky Festival and Feis Ile, The Scotch Malt Whisky Society have released several single cask bottlings. Most of these whiskies are available for members to purchase at society venues or online, but there are a few exceptions; 3.308, 53.248 & 52.252 will only be available from members’ rooms and on the island during Feis Ile whereas 29.144, the 8yo Laphroaig, will only be available for members to purchase on Islay during the festival this week. Exclusively exclusive. 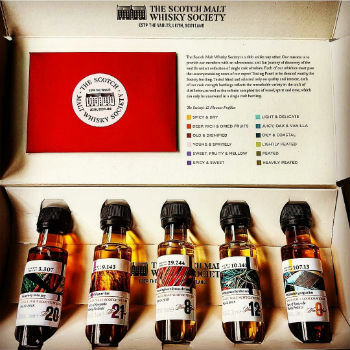 I was very kindly sent the above beautiful sample pack from The Scotch Malt Whisky Society containing drams from five of these single casks which are: 3.307 Bowmore 20yo, 9.143 Glen Grant 21yo, 10.141 Bunnahabhain 10yo, 29.244 Laphroaig 8yo, and 107.13 Glenallachie 9yo. With Feis Ile now in full swing, it only seems appropriate to give my thoughts on the 8yo Laphroaig today, seeing as today is Laphroaig’s Open Day. Nose: Classically, clean, coastal and medicinal, with remarkably soft smoke. Elastoplasts, Deep Heat, eucalyptus, some fresh mint, rockpools and lemon zest to begin. Then there’s charred logs, scorched grass and a snuffed out peat fire along with a lovely creamy vanilla note. Palate: Smoke to the fore! Intense peat reek, tar, oilskins, chewy oak, and burnt caramel. Then a nice herbal and earthy thing – rosemary with crispy smoked bacon, a touch of balsamic vinegar and some salt and vinegar crisps. Finish: Long, warming medicinal smoke, with some savouriness; clove, smoky bacon crisps and peat ash. Overall: A fantastic, classic, example of young Laphroaig. Medicinal, coastal, and smoky – all the reasons people either love whisky from this distillery or hate it. 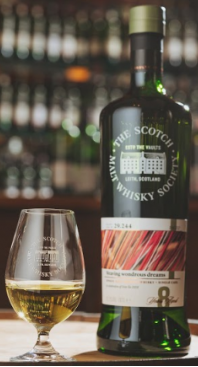 I have no doubt that all 222 bottles from this single cask will be snapped up by the time the weekend comes, so if you’re a SMWS member and happen to be one of those jammy buggers who are on Islay at the moment, seek out the society’s base, Islay House, and grab one while you can. This entry was posted	on Tuesday, May 29th, 2018 at 9:15 am	and is filed under News, Reviews. You can follow any responses to this entry through the RSS 2.0 feed. You can leave a response, or trackback from your own site.